Abstract: Matrix LED headlights produce a glare-free high beam through pixel-level digital control of individually addressable LEDs. These adaptive lighting systems interact with driving environment via the vehicle onboard camera system. A matrix LED headlight is an adaptive driving beam (ADB) system equipped with an array of individually addressable and controllable LEDs which work together with an electronic control unit (ECU) and traffic detection device in order to optimize lighting scenarios for improved driving visibility at night time, without applying glare to drivers in oncoming or preceding vehicles. This adaptive headlight takes advantage of LED's superior controllability which allows the headlight to respond to centralized control in a very dynamic way. 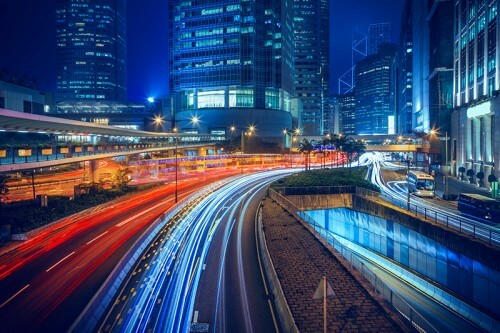 Together with its unparalleled reliability, instant illumination, high energy efficiency and ultra-low latencies, LED technology offers intriguing possibilities for smart automotive lighting. 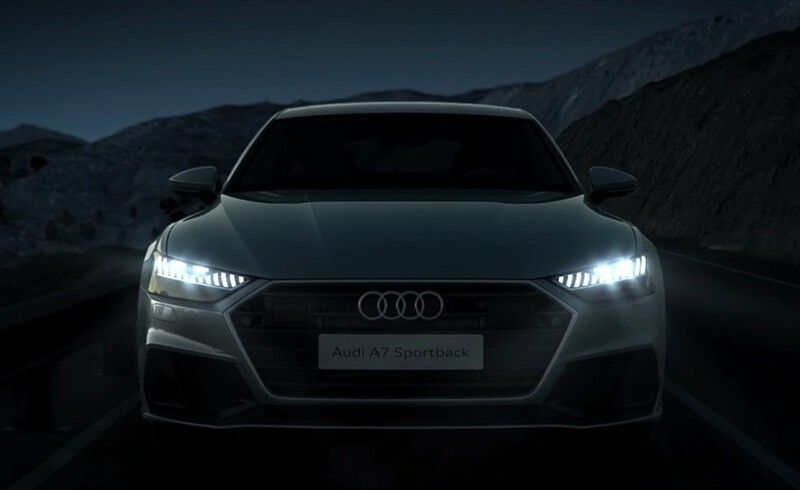 Automotive headlamps are configured to switch between a low beam and a high beam depending on road conditions and traffic. A high beam provides a bright, center-weighted distribution of light with a high illuminance and pierces the darkness far into the distance. 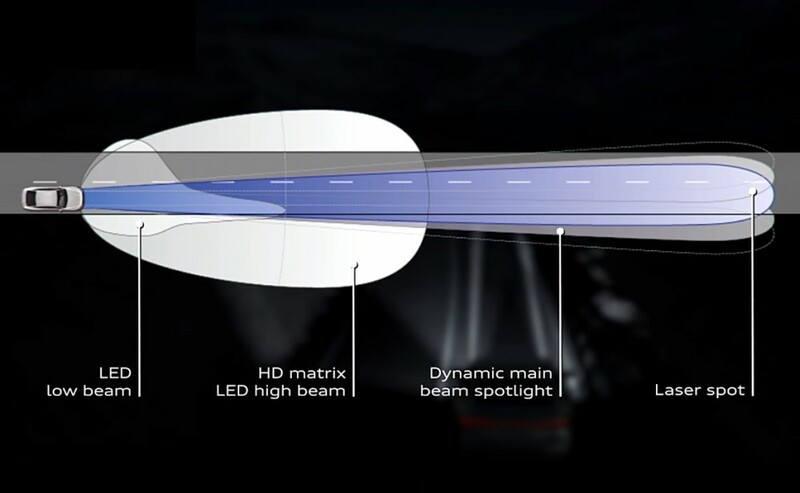 High beam illumination gives priority to extending a field of view for maximum driving safety, without taking in account that this far-reaching beam can render other road users exposed to potentially dangerous glares. The low beam is designed to provide short-range forward illumination with a horizontal cutoff at an upper end to prevent blinding other road users. Compared to a high beam, the low beam is a compromise between forward distance and glare control. It minimizes glare for other road users, but its short beam distance gives the driver limited time to react to any potential dangers at high driving speeds and on uneven roads. A conventional adaptive front-lighting system (AFS) has limited reliability as it makes excessive use of the headlight's mechanical system which can be impaired by wear and vibration over time. Alongside basic operations such as switching between high and low beams, and turning off beams directed toward the opposing lane, adaptive beam control within this AFS headlight assembly is implemented by changing beam direction so as to exclude an oncoming vehicle from illumination coverage, rotating a mechanical shade to block part of the beam, or swiveling the beam as the vehicle turns. The latency of this mechanical system is too high to respond to complex prediction algorithms. Such AFS lacks interaction between the light source and ECU because the inherent technological constraints of halogen and HID headlight bulbs make it impossible to implement intelligent control of light output and other advanced features. 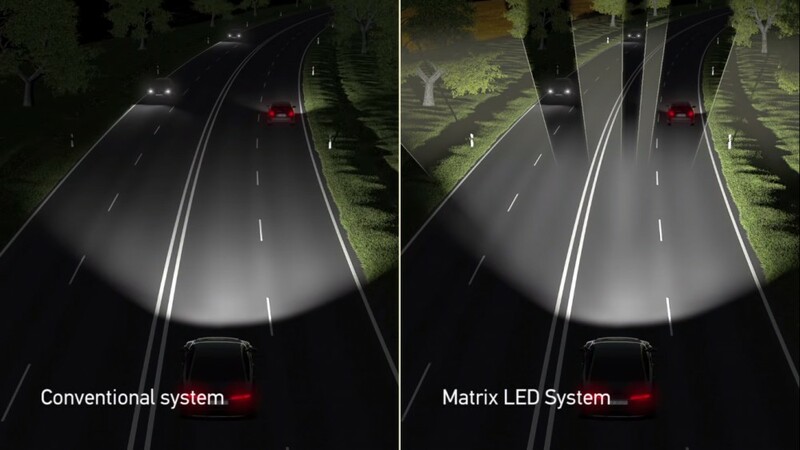 Recognizing the limitations of traditional adaptive headlights, matrix LED lighting systems have been developed to provide intelligent front lighting with dynamic control and split-second beam adaption in response to changing driving conditions. 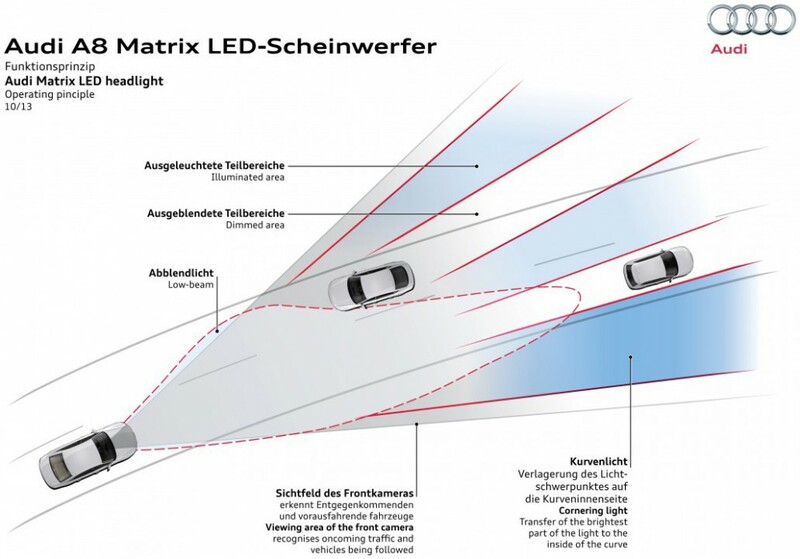 Although matrix LED headlight systems demand sophisticated engineering, they work on a very straightforward principle of operation - pixel-level digital control over the high beam. Unlike gas burning and arc type lamps, LEDs are semiconductor devices which produce photon flux (light) by passing an electric current through a p-n junction biased in the forward direction. Light intensity can be dynamically and precisely controlled by regulating the current flow through the LEDs. These semiconductor diodes can be instantly activated and require no warm up time. The ability to withstand tens of thousands switch cycles reinforces LED's application advantage in digital lighting system. Excellent dimmability lends LED headlight modules unprecedented versatility. High beam LEDs can be dimmed down to take the role of daytime running lights. 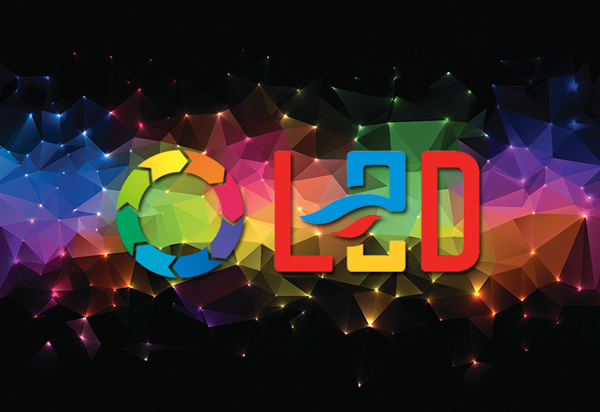 Moreover, LED's compact form factor, solid state nature as well as flexibility in optical control offer incomparable design freedom and engineering applicability in smart ADB systems. Matrix LED headlights comprise a plurality of LED engines assembled in a joint module. Each LED engine is equipped with a dedicated driving circuit for variable control of luminous intensity and on/off switching. Use of reflectors and/or lenses allows the LED module to provide a huge number of variations in optical distribution without the need for any pivoting mechanism. Thus matrix LED technology splits up the previously one-spot high beam into multiple sub-beams that can be independently controlled. 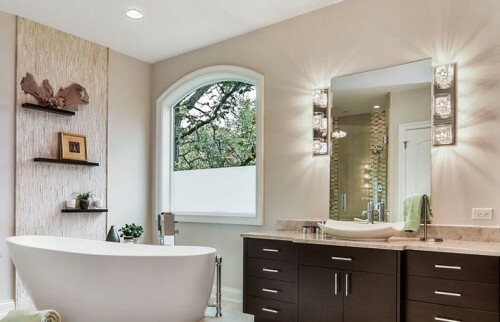 High power LEDs deliver high efficacy and high flux density that enable tight beam control as well as exceptional high luminance, making these individually produced beams equally as powerful as the one-spot halogen beam. In conjunction with a substantially higher color temperature (around 6,000 Kelvin) which causes less driver fatigue and delivers enhanced visibility, the high beam LED light packs a powerful punch, all without taking up a ton of room in the headlight assembly and drawing a ton of power. Conventional AFS headlights react only to vehicle's driving status such as the wheel rotation speed, yaw (motion along the vehicle's vertical axis), and movement of steering wheel. 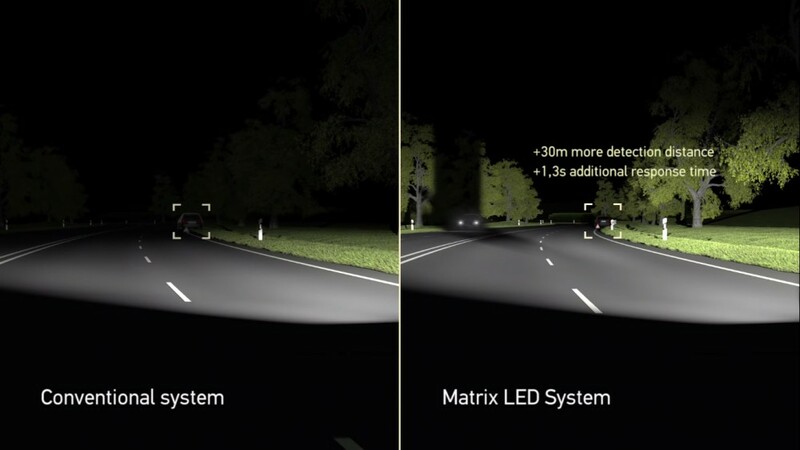 Matrix LED systems take a leap forward with its ability to interact with driving environment via the car's onboard camera system in which an imaging sensor monitors the road environment in front of the vehicle. The vehicle-mounted camera which is sensitive to visible and near infrared light can detect virtually all traffic within its detection range. 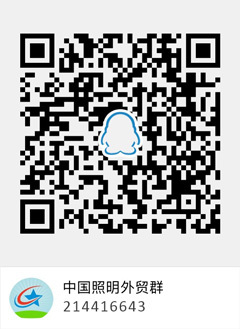 Data collected by the camera are interpreted by the ECU which then sends directions to the control circuitry regulating the light output of each LED engine. 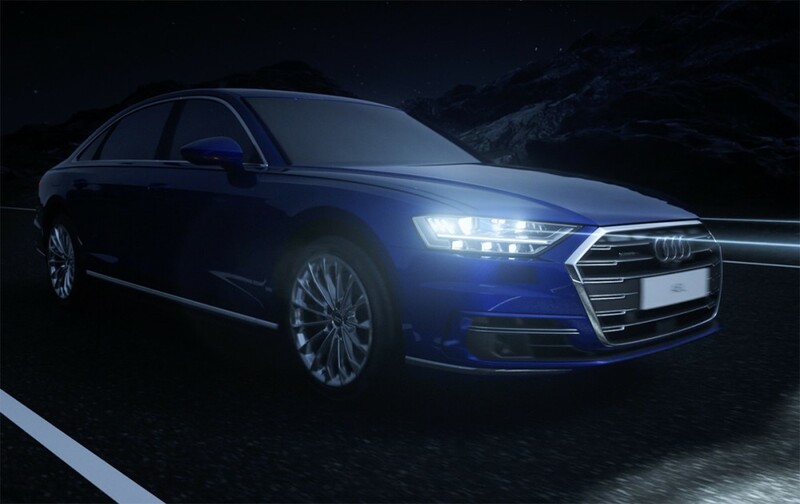 Upon detection of an object in front of the vehicle, the adaptive lighting system will mask out the oncoming vehicle by dimming or switching off LED engines that produce distracting glare while other LED engines of the high beam light continue to illuminate everywhere else on the road. When driving in curves, the high beam LEDs of the matrix headlight will shift the focal point of the light along the curve and illuminate the side of the road more than the road itself. Computer vision can extract the road lane information, which can help improve the precision of adaptive lighting. Additionally, integration with GPS makes it possible to perform predictive headlight control. 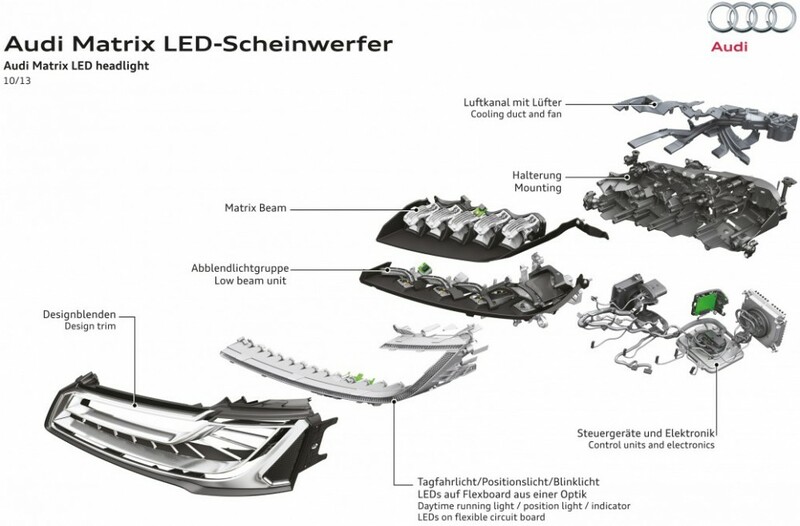 Matrix LED technology has come to be a growing interest for leading car makers and auto parts manufacturers such as Audi, BMW, Mercedes-Benz, Opel, Volvo, Varroc, Hella, and Bosch. Audi and Hella recently introduced the HD Matrix LED high beam headlight which integrates 32 small, individually controllable LEDs arranged in two rows. 64-step dimming enables HD Matrix LED to create millions of light patterns. 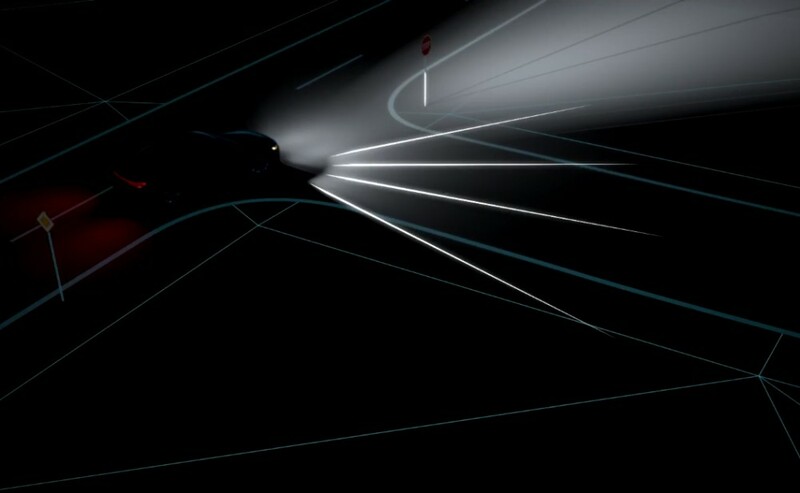 The high beam system uses feedback from a camera, the navigation system and other sensors to provide precision, intelligent forward lighting. 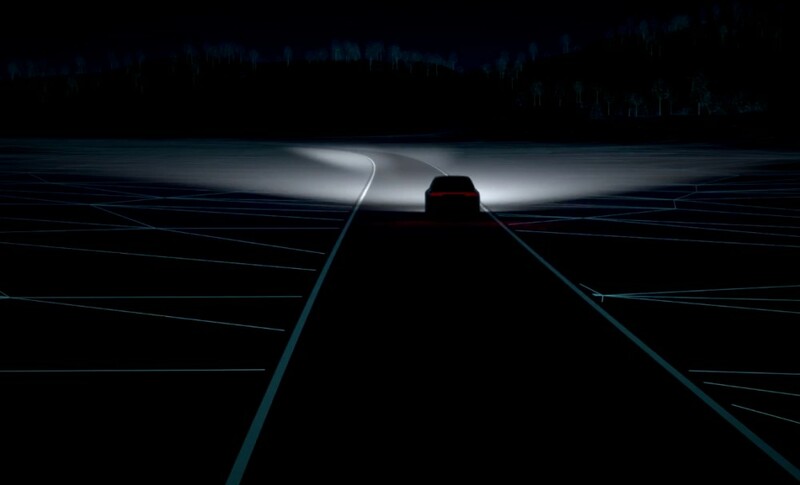 The adaptive lighting mode is activated outside of urban areas at speeds of 30 km/h (18.6 mph) and above. The LEDs in the Matrix LED headlights also serve as cornering lights and use predictive route data supplied by the MMI navigation system to automatically illuminate parts of road lying around a coming curve before the driver arrives there. HD Matrix LED headlamps for selected top models integrate laser modules to double the range of the high beam. The dynamic laser high beams automatically turn on at 70 km/h and dims when the camera recognizes other vehicles in its range. Although matrix LED headlights have compelling safety values, car manufacturers are challenged with increased circuit, thermal and design complexities, which ultimately adds to the total system cost. Matrix lighting systems typically have a lighting matrix manager (LMM) device which provides load regulation and pixel level control of the LEDs. The LMM usually contains a microcontroller that controls the drive ICs of each LED engine via the SPI interface and transceivers that communicate with ECU. Each LED engine is connected to low voltage switch (MOSFET) which can be pulse width modulated (PWM) at a programmed frequency and duty cycle. The drive IC circuit embedded in the MOSFET effectively prevents LED damages from voltage variation and transient spikes. Complex LED matrix circuitry not only increases PCB space, but also leads to raised electromagnetic interference (EMI). Thermal management must keep pace with the high power density operation of the LED modules. Tight space within the headlight assembly may cause buildup of heat flux around the LEDs. Continuous operation beyond the maximum rated junction temperature accelerates degradation of materials utilized in the LED, such as phosphor or encapsulate, which results in lumen depreciation, color shift and shortened lifespan. Heat dissipation of the light source is typically provided by aluminum heat sinks which have large surface areas. The thermal management system may include electric fans to facilitate convective cooling.